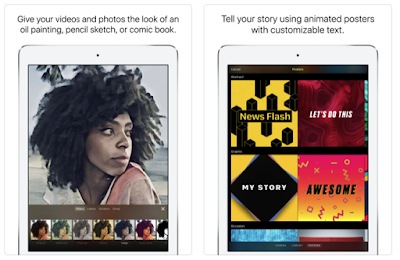 Clips is a relatively new video app from Apple. It has been in the iTunes App store for few months now. This is especially helpful to use in digital storytelling activities in class. Clips allows you to easily create beautiful videos in real time and with no controls. Its editor is simple and easy to use. It no tracks, timelines, or complex editing tools. You can simply record your video, snap pictures or upload photos from your library, add a music track or select one from built-in soundtracks. Next add different effects to illustrate your video content. These include artistic filters, animated text, fun stickers (featuring characters from Star Wars, Disney, Pixar and more. ), posters, emoji, live titles and many more. When your video is ready you can save it to your iCloud, share it on social media websites, or share it with others via Messages. Other features provided by Clips include: 'create animated titles and captions using your voice; urn any photo or video into a moody painting, elegant pencil sketch, or comic book illustration; use effects and filters while recording or apply them to photos and videos from your library; add emoji, animated speech bubbles, shapes, and customizable text labels to your photos and video clips;use full-screen posters with animated backgrounds and customizable text to help tell your story…' and many more. Check it out and share with us your feedback.